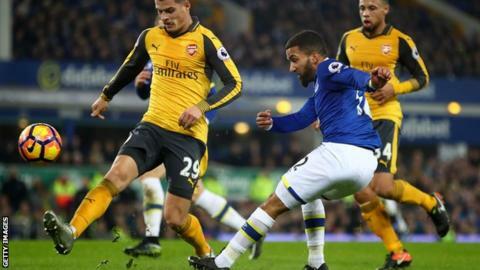 Everton winger Aaron Lennon is not suffering from a long-standing mental health issue and is expected to make a full recovery in the short term, BBC Sport understands. The 30-year-old was detained under the Mental Health Act by police over concerns for his welfare. He was taken to hospital "for assessment" after police were called to Salford on Sunday. It is understood his condition is a recent occurrence. Lennon is now "receiving care and treatment for a stress-related illness", his club has said. The England international, who joined Everton from Tottenham in 2015, has not played for the first team since February. Greater Manchester Police said: "Police were called at around 4.35pm to reports of a concern for the welfare of a man on Eccles Old Road. "Officers attended and a 30-year-old man was detained under section 136 of the Mental Health Act and was taken to hospital for assessment." News of Lennon's admission has led to an outpouring of support on social media from those involved in the game, as well as fans of his current and former clubs. Everton tweeted on Wednesday: "Thank you for all the kind messages for Aaron. We are supporting him through this and his family has appealed for privacy at this time." Lennon's representative, Base Soccer Agency, tweeted: "Everyone at Base Soccer sends their support to @AaronLennon12 - get well soon and stay strong." Ex-Liverpool and Aston Villa striker Stan Collymore, who has been affected by depression: Thoughts and love with Aaron Lennon and his family right now. I know that place, and I know he'll be fine with good support from us all. Former world heavyweight boxing champion Frank Bruno, who has battled depression: Thoughts are with Aaron Lennon today, stay strong & as positive as possible, there is light at the end of tunnel. You will get through this boss. Lennon's former club Tottenham Hotspur: Get well soon @AaronLennon12, we're all thinking of you. The Professional Footballers' Association: Get well soon Aaron, we are all thinking of you and here to offer our full support. Former Queens Park Rangers and Burnley defender Clarke Carlisle, who played with Lennon at Leeds United: Love and blessings to my old teammate @AaronLennon12. Nail this now and there's plenty more left in the tank my friend. Ex-Manchester City and England midfielder Trevor Sinclair: Thoughts with Aaron Lennon right now. Former Aston Villa forward Darren Byfield: Hope Aaron Lennon will be OK and gets the help he needs. Former Watford and Sheffield United striker Danny Webber: Get well soon Aaron Lennon. England cricketer Kate Cross, an ambassador for Opening Up Cricket which promotes mental wellbeing: Fingers crossed Aaron Lennon is OK. Another reminder that mental health affects us all. Be kind.